14k gold custom made bridal set ring consisting of round shape, natural diamond, weighing 1.41 carats, having a L color and VVS2 clarity, according to GIA grading scale. The center stone measuring 7.17mm x 7.12mm x 4.46mm and carries a GIA grading report. All surrounding diamonds are genuine with a total carat weight (cttw) of 0.70 carats. Comments: Additional clouds are not shown. Surface graining is not shown. 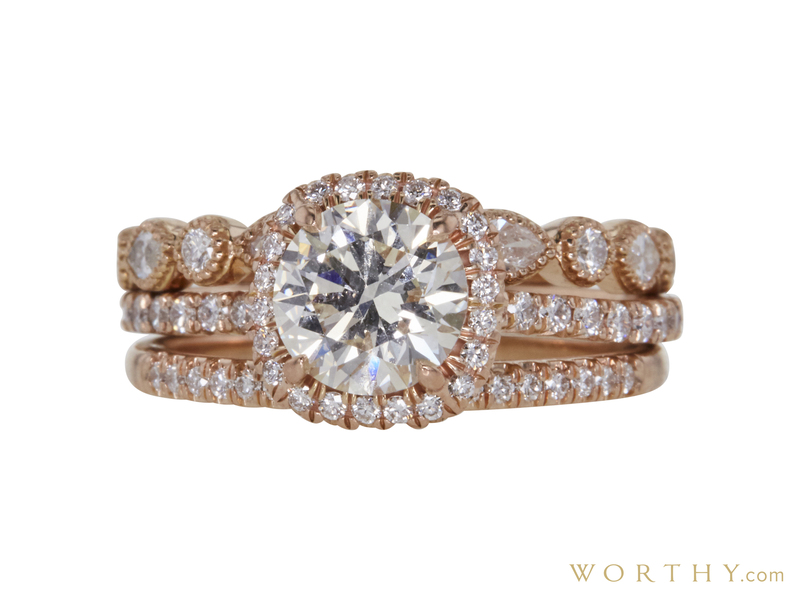 This item was graded at Worthy Labs by GIA Graduate Gemologists. Grade and Carat weights are approximate as permitted by setting, unless clearly specified by a reputable independent lab, or hallmarked. Three rings are from James Allen. One or more small side diamonds have faint to strong fluorescence.